SAN FRANCISCO, CA. — Join Golden State Star Point Guard Stephen Curry and his father, former Charlotte Guard, Dell Curry for basketball instruction and fun at the 2014 Citi Dell & Stephen Curry Basketball ProCamps in partnership with State Farm. Location: St. Ignatius College Preparatory, San Francisco, CA. Date: Sept. 20, 2014. Session 1 Time: 9:00 AM to 12:00 PM for boys and girls grades 1 – 12. Cost: $199. Session 2 Time: 2:00 PM to 5:00 PM for parents and chld pairs. Cost: $299. Package Deal for Both Camps: $449. Source: Procamps.com. Campers will experience various stations, specializing in fundamental skills of basketball. Each camper was placed on a team according to his or her age. 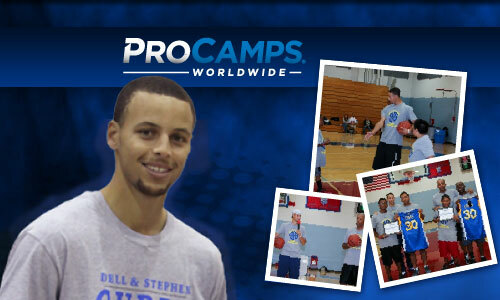 Dell & Stephen Curry will give talks highlighting the finer points of the game of basketball and beyond. Parents and guests will be able to listen to camp guests in designated areas. Stephen Curry has played guard for the Golden State Warriors since being drafted by the team in the first round of the 2009 NBA draft. He’s best known for his three-point shooting skills. Sports Speakers 360 is a booking agent for pro athletes. If you would like to book Stephen Curry for a speaking engagement, appearance or endorsement, contact Stephen Curry’s booking agent for fees at 1.855.303.5450.